Ok gang of four, it’s time for the second part of previously started list of the top 10 Essential Arcade games. I must say that these Top 5 listed below are actually so good, that forget the multicade cabinet, these games are good enough that you could get them as God intended: as their own arcade machine. Seeing that an arcade machine on its own costs anywhere from 1 to 2 grand, that’s some high praise for what I have to believe are truly the cream of the crop. 1) The game has to be one that truly is played a lot on my current machine. I consider my group of friends and family to be a pretty good slice of the population. Therefore, any game that’s currently being played a lot on my arcade machine is therefore popular enough to make the cut. This rule actually eliminated a lot of all time classics such as Q-bert, Dig Dug, and Gauntlet because honestly they aren’t really played much. 2) Only one game from each series. That would be any game out there that had an original and then some sort of sequel. So even if I wanted to include both Pac-Man and Ms. Pac-Man or Donkey Kong and Donkey Kong Jr. I could not. I have to limit myself to only one of those games to be fair. 3) This is just arcade games. Most prefab Arcade cabinets only give you the choice of arcade games anyways. So although my cabinet as an NES, an Intellivision, etc. I’m going with the premise that these other classic systems wouldn’t be options. What better way to kick off the second half of this list than with this 1982 masterpiece designed by Eugene Jarvis for Williams Electronics, a publisher we’ll heard about again in this blog. An early example of the “Run ‘n Gun” style game, Robotron 2084 was unique and revolutionary in its control design, utilizing the first and second controllers to do different things i.e “RUN” and “GUN”. In addition, like some other entries in this top 5 list, it took previous concepts started in other games and made them better. In this example, the base game was another all time classic Berserk in which a character ran around shooting robots with an omnidirectional lazer gun. But Robotron took that concept and took it six steps further, adding amazingly colorful sprites, better handling, and insane amounts of robots to fight. In fact, whereas Berserk had to add the Evil Otto bouncing face to coerce the player into continual movement, Robotron does the same job by just giving the player not even time to breathe let alone stand still. It’s true. 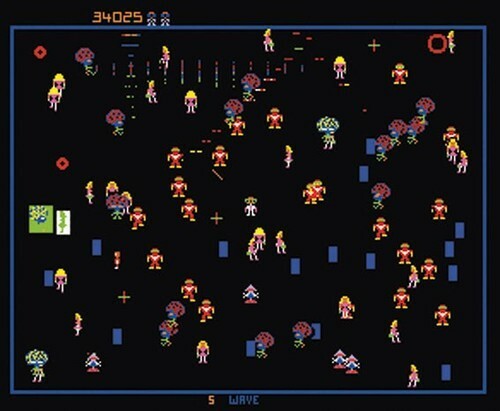 The typical game of Robotron in my basement man cave lasts about 3 to 4 minutes due in large part to the break neck speed in which the enemies seem to swarm up in your grill. But that’s also a part of the genius of its addictive design: because the games are so short, there’s not a lot of time to think about whether you want to play again, you just do it. Probably would piss me off in a traditional arcade hall, but with your own machine and unlimited tokens, it’s the closest thing to video game crack. Here it is! The Grand daddy of all SHUMPs in my opinion. For those of you not in the “know”, a SHUMP is gamer lingo for a “shoot ‘em up”, a game in which the player takes a lone character preferably with a death wish and sends them against wave upon wave of enemies while dodging their attacks. Some many successfully argue that Robotron 2084 is also a SHUMP, just an multidirectional one instead of fixed vertical one, but really for me, I reserve the term for truly games that are direct descendants of Space Invaders. In other words, Top down scrollers, and for me Galaga is the best of the best. 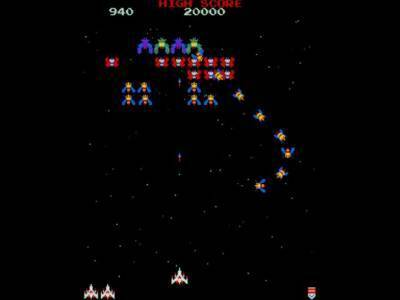 Like Robotron, Galaga is so good because stands on the shoulders of other all time classics but then improves on those fundamentals in such a way that it becomes a vastly better game than those that came before. In Galaga’s case, it has it’s roots in games like Space Invaders, Phoenix, and Galaxian, but takes the great parts of each and 6 million dollar man them: Bigger, faster, stronger. In fact, after playing round upon round of Galaga, it’s very difficult to go back and play games like Space Invaders as everything moves so slow and clumsy in comparison. And sure, others will argue that other games later stood on Galaga’s shoulders and made even “better” SHUMPs, but for me and the vast majority of those that play my arcade cabinet, Galaga is like a white hot center of a new sun. Sure there are other things that eventually surround it, bury it, use it for creative energy, but if you cut away all those other layers built on top of it, the core is still really something fantastic. The difficult is solid, the villains challenging, the sprites perfectly designed to maximize style vs. simplicity. Plus, with the addition of making the player weigh risk vs. reward in battling to get a second ship at the cost of a possible life, it’s got some real TNT “we know drama” there. Overall everything you’d want in a game, and one that continues to make new fans everywhere. In fact, my wife, who isn’t much of a arcade gamer, and never played Galaga growing up, swears by the game now. It’s her absolute favorite on my current arcade cabinet and trust me, that’s a big compliment to any killer app. If this was my own personal list of all time favorite games EVER, then this game would no question have the top spot. However, if I’m true to the rules I stated above, this game has to take a back seat to some others because honestly it’s not a game a lot of people other than myself play on my arcade cabinet. That’s personally very sad, because I love the game so very much, but whether its too challenging or complex or taunting, most people just skip over it. I mean I could write a whole slew of things about how this single handedly invented the whole concept of side scroller action, put the greatest game giant Nintendo on the map, was the basis of a fantastic documentary a couple years back called King of Kongs, blah blah yadda yadda etc. But all that information could be got from reading Wikipedia or any other person’s blog on the topic. That’s not what you are here for. You are reading this blog because you want to hear my insights, so this one is coming from the heart. I personally have been playing Donkey Kong since I was 4 years old and I’ve been obsessed with it ever since. Whereas many of the kids my age were playing Pac-man, frankly the game bored me to death at times. That’s because it was the same board over and over again. 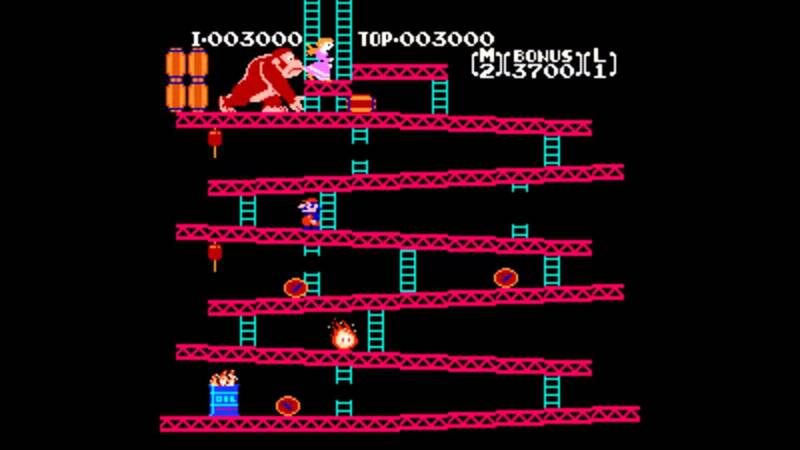 With Donkey Kong, there was variety of stages and a clear goal, get to the top of the maze dodging whatever crap that big ape was gonna pitch your way. 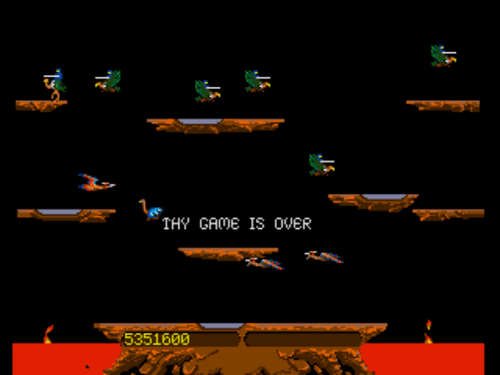 We had a cartridge port of the game for our old Atari Home computer system and my memories of it were taht it was a pretty faithful arcade translation. All the stages were in there, including the pie level, (something criminally left out of the NES port), so I had no problem taking my skills honed at home to the arcade. For me it was almost like doing homework. I’d play levels at home, learn the tricks needed to succeed, and then I’d go to Aladdin’s Castle and try my best to set a high score. Of course I was all of 6 by that time, so it wasn’t like I was setting the world on fire with my scores, but I remember being pretty proud of myself for even trying to get on that leader board. I mean really trying, not half assing my way on through luck. I say that with all sincerity. Donkey Kong demands that kind of discipline to succeed. It’s not just a game you can play once or twice and feel like you are going to be good at it. Like looking at the Matrix scrolling code numbers, you gotta set the patterns and how things are going to shake out way ahead of time. That’s why it will always be my favorite. It’s the holy grail of dedication and commitment wrapped up in a sea of rolling barrels. Did you honestly think we were going to get through a top 10 list of arcade games without listing a Pac-man game? Arguably the most important game franchise of the golden age of arcades? If you did, then sir, you can see the door, because you really don’t know jack. As I said before in my Donkey Kong portion, I personally dislike Pac-man and all its various clones mainly because I think the game is annoying repetitive. But even with my dislike of the game, I can’t argue its importance nor can I honestly say I don’t play the game a crap load. Mainly this is because one of my other cronie friends set the high score on my arcade machine, and that’s something I can not abide. So I spend a lot of my time, brain cells, and swear words trying to get better at really playing it i.e. the dedication aspect I talked about earlier with Donkey Kong. However, true to myself and my above mentioned dislike of the franchise, for this list I had to select the game which I do feel is a vastly superior version over the original: Ms. Pac Man. 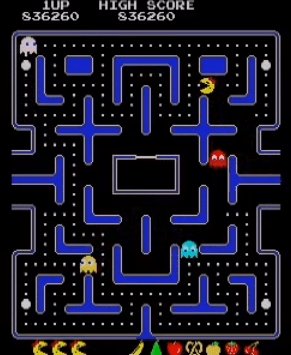 As the world’s first gaming mod/hack, Ms. Pac Man started life as just that, an American hack of the original Japanese game in which the configuration of the mazes was changed, the enemies made more intuitive and overall the concept improved by those who were actually playing it. The hack was so successful and demanded that soon Namco made the game an official sequel and thus we have Ms. Pac man. As a game, I find Ms. Pac Man much more digestible that Pac-man for all the reasons listed above, but mostly due to the fact that the level layouts do change adding some variety to the endless parade of mazes to devour. Plus, I do have fond memories of playing the game with my older sisters at the Pizza Hut in my hometown of Ebensburg when I was young. They had one of those cocktail style versions which you looked down on to play. To this day, I still love everything about that concept. You could rest your drink on the top and still crush at gaming. It should be a standard for all coffee tables everywhere! Like there was even a doubt in anyone’s mind what would be number 1. Other than Fooseball and drinking until you can’t see straight, it’s the official past time of those that frequent my man cave. More than any other game played, Joust sees action more times than not, and honestly, it is the one game on the list I could see myself shelling out a grand to get as it’s own stand alone machine. But I want to real from the start about this game. It’s not as if it’s one I’ve been playing since I was a kid or something. Joust is definitely a more recent phenomenon. Sure, I did play Joust occasionally as a kid through high school/college on the NES but it never really clicked with me. Then I got my arcade cabinet, and me and the boys were looking for a game we could compete for high score with that was also co op, so that people didn’t have to wait to take turns. And that’s when I remembered Joust. So we started playing it, and we haven’t stopped since. Literally, almost every other time the machine is turned on, its for Joust. And for good reason. Like the other Williams Electronics game on this list, it’s insanely addictive. But unlike Robotron 2084, Joust isn’t built on any other games shoulders. It’s wholly original and there’s not a game out there like it. I almost view it as a sports game rather than traditional action game, because the action of swooping around and trying to smash competitors off their flying ostriches for points, seems like a real sport as devised by some mad genius in some fantasy land far away. The gameplay is easy enough for anyone to pick up and start playing immediately, yet like any true sport, has so much nuisance and layers that you can also tell which players have spent time and effort practicing enough to get good. You can play by yourself, cooperatively with a buddy, or competitively with a buddy, so it already has a variety of different play modes built in, all of which you could actually play in one sitting. You could start by playing cooperatively with your pal, then backstab him for extra points, after which you are by yourself soaking up the left overs. Rinse and repeat when your buddy respawns, unless he’s wise to your tricks and does the same to you. Plus, as I said at the end of the day its a single coin/high score game, and there aren’t really a ton of co op games that can say that. Most co ops such as the beat ‘em ups or Rampage or something, have insert coin buy ins to continue play, which when you have infinite coins really are good tests of ones ability to play a game well. Getting “X” numbers of lives and running the table for that big pay out, that’s where the real men sit down for their meat and potatoes. Joust can count itself among them and for that it’s already miles above the competition. So Joust ends our list of the top 10 essential arcade games in my humble opinion. I hope you’ve had as much fun reading my list and I’ve had in thinking about it. As always though, if you have ideas for games that should have made the cut, feel free to leave them below in the comments. I am a little bit behind with all your shows and blogs (heard just the third episode of your podcast yesterday, on my boat – so yeah, i have a lot to catching up to do…), but on this i HAVE to commend. First of all, its very interesting, because we all are (nearly) in the same age, it seems we not only share the interest in the same comic books, we also care for the same games, movies and tv-shows. Even if you are sitting on the other end of the atlantic ocean, Donkey Kong, Spidey, Magnum P.I., Han Solo and so forth, they know no borders – which is great! So, i really dig your best of arcades list. All of it exceptional games, as though my personal list is a little bit different. I mean, ok, Donkey Kong has to be on it, so i make it my Number 5. On 4 : Asteroids. It´s very old school, yeah, and nothing much happens, i know, but it was one of the first machines i could get my hands on, somewhere in spain during the holiday season. I made the trip with my father and he was really happy to give me coin after coin, because then i would be gone for a few hours and he could play tennis or simply relax from the terror i was. There, in this little arcade hall by the hotel, was also “the other” game with vector graphics, Battle Zone, which i liked almost as much as Asteroids. ALMOST! 3rd Place : Another one with vector graphics. Another very simple concept and still one of the most addictive Games i´ve ever played, just to be on top of the high score board : Tempest. 2nd Place : It was hard, it was unforgiving, it costed a lot of money, but it was something new, something beautiful, something different : Dragon´s Lair. These are all solid picks, my friend. Especially Centipede. I will say I have three older sisters and they all agree that Centipede is the best arcade game by far, so I have played a TON of this game over the course of my life. But, in the end, I just always followed my older brother, Dave’s example and somehow Galaga ended up being my classic SHUMP of choice. Still though, very solid list of games! Love the Tempest pick, as that’s a game I wish I got into more! As a side note, solid piece of writing as well…any chance you might want to be a contributor to the Ghosts?